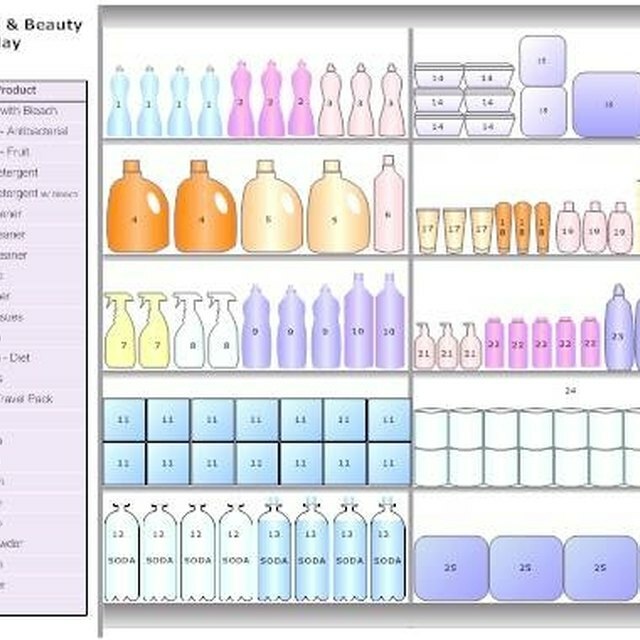 Planograms are diagrams primarily used by retailers to show where products should be placed and how they should be merchandised. Many chain retailers use planograms to maintain consistency in various stores, although the planograms may vary somewhat according to the different needs of each location. Some are very detailed and some are basic, intended for fast turnover of products and displays. There are basically three types of planograms. The most basic type of planograms uses box shapes to represent different products, with the name of the item typed inside the box. For example, a planogram designed for a condiment aisle might have rows of thin rectangular boxes to represent ketchup bottles. The brand of ketchup will be typed inside of the box. There might be two rows of each brand depending on the store’s needs. If they typically sell more of one brand than another, there will be more facings of the high seller. These planograms are usually black and white, two-dimensional diagrams meant for use in grocery stores or areas of retail department stores where merchandise turns around quickly. Pictorial planograms are more complex and detailed than basic planograms consisting of only boxes and text. Pictorial planograms incorporate images of the product and how it should be displayed. They are usually drawn more accurately to scale and are in color to provide an exact depiction of how the items are to be merchandised. This type of planogram is commonly used in apparel and department stores, where displays are more prominent and presentation is imperative. They may illustrate how shirts should be organized on a sales rack or they may show how dishes or small appliances should be displayed. These planograms are usually flat, two-dimensional, computerized illustrations. As technology continues to advance, so do the applications and software used to create planograms. These advances have led to the growing popularity of three-dimensional planograms. They usually encompass an entire department layout, and computerized images create photographic illustrations of how the entire department, including promotions and displays, should look. Three-dimensional planograms are usually drawn to scale and include aerial views of the area.